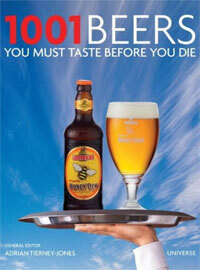 Seven upstate New York brews are included in a book heralding “1001 Beers You Must Taste Before You Die,” according to food and drink folks at Syracuse’s Post Standard. And Albany’s Times Union laments that no capital region brews are included. Wailing Wench by Middle Ages Brewing Co.
CascaZilla by Ithaca Beer Co.
Imperial Pumking by Southern Tier Brewing Co.
Krampus Imperial Helles Lager by Southern Tier Brewing Co.
You can check out 1001 Beers You Must Taste Before You Die on Amazon.com. ← Good year for Genesee Brewing Co.
Southern Tier consistently produces my favorite brews, but I must have missed those last two. Gemini by ST would definitely make my personal list of must tastes. I haven’t seen the full list either, so imagine there’s a good chance there could be a few more beers from NYS, especially downstate. As for Southern Tier, well, pretty much anything they make is my must taste list!